Update May 24, 2016: No longer free. You may get it for $2.99 only. A Pumpkins’ Halloween is a wonderful tale that embodies all the right attributes that sum up the spirit of the holiday of Halloween. Ghosts, zombies, vampires, maniacs, witches, and talking jack-o-lanterns all take turns playing different roles in this multi-storied novella. 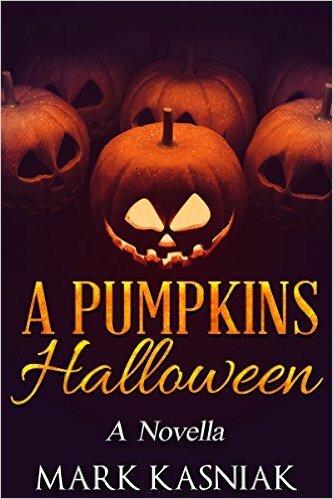 A Pumpkin’s Halloween brings to you everything you remember that was fun about Halloween along with a good dose of dark humor, while at the same time scaring and sickening you with its real-life tales of depravity. A Pumpkins’ Halloween follows the story telling of five jack-o-lanterns as they come to life on Halloween evening. As the jack-o-lanterns banter back and forth while giving each other grief, they find themselves forced to look out on the street because, after all, they’re stationary, they’re pumpkins. As Halloween progresses, each jack-o-lantern takes turns telling a story in celebration of the holiday and one will ultimately be judged the winner at night’s end. However, there is a stipulation. Each story has to be about the trick-or-treaters that the jack-o-lanterns watch passing them by as they go about in search of candy. Also, each story gets to be picked by one of the other jack-o-lanterns for added difficulty. The stories the jack-o-lanterns tell focus on such taboo subjects as a father who is not very good at being one, a little boy who likes to play with matches, a woman who doesn’t enjoy the company of children, not even her own, and a psycho killer who likes to target trick-or-treaters for his murderous games.